About Parliament | History | Territory symbols | Chartist checkbox | Did you know? The ACT Legislative Assembly is a single House of 17 members (MLAs) who generally hold office for a fixed term of three years. Members are elected by a proportional representation electoral system, known as the Hare-Clark system. Voting in ACT elections is compulsory for all citizens aged 18 years or over who have lived at their current address for one month or more. According to requirements in the Australian Constitution, in 1908 the Commonwealth Parliament chose the Yass–Canberra area to be the site of Australia's national capital. The Federal Capital Territory was established in 1911 and became the Australian Capital Territory in 1938. The ACT was initially managed by the federal minister responsible for Territories, who worked with a number of advisory bodies. In a 1978 referendum voters in the ACT rejected a proposal for self-government, with 63% voting in favour of keeping the existing governance arrangements. Self-government began in 1988 when the Federal government passed the Australian Capital Territory (Self-Government) Act. The first elections for the new Parliament were held in March 1989 and the first sitting of the new Legislative Assembly took place in May that same year. The ACT has no official colours, but blue and gold are used by most sporting teams. While the Australian Capital Territory has no Coat of Arms, the Coat of Arms for Canberra was granted by King George V in 1928. The Canberra Coat of Arms shows a shield supported by a black swan and a white swan, which symbolises the Aboriginal and European people of Australia. The Coat of Arms bears the motto ‘For the Queen, the Law and the People’. The ACT has had its own flag since 1993. It is based on the first flag for the city of Canberra. It uses Canberra's colours of blue and gold and shows the Coat of Arms and Southern Cross. 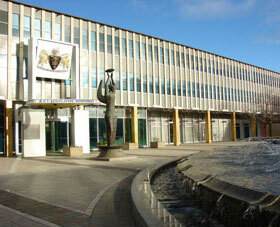 The Legislative Assembly is situated adjacent to the Civic Square in the centre of Canberra. The building was refurbished in April 1993 by Mitchell, Giurgola and Thorp, the same architects who designed the Commonwealth Parliament House. The first sitting took place in February 1994. The royal bluebell was declared the official Floral Emblem for the Territory on 26 May 1982. The gang-gang cockatoo was adopted as the Animal Emblem for the Territory on 27 February 1997. The Chartist checklist was a series of demands for responsible and representative government that spread throughout the Australian colonies from the mid-19th century. The ACT has no local council. Matters normally looked after by a council are dealt with by the Legislative Assembly. The ACT Legislative Assembly is the only governing body in Australia that has government responsibilities at both a State and local level. The ACT is represented at the federal level by two Senators, elected for the term of the House of Representatives. The leader of the government in the ACT is known as the Chief Minister. Casual vacancies in the ACT Legislative Assembly are filled by a re-count, which means that the second most preferred candidate at the last general election is selected. This avoids the need for a by-election.